Darren Everson in the Wall Street Journal describes the shaky start of the new Yankee Stadium, and along the way remembers some other ballparks that were not popular with the fans. 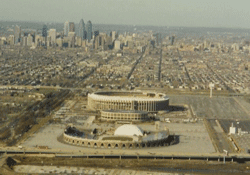 Veterans Stadium, the former home of the Philadelphia Phillies and Eagles, was reviled not only for its ragged artificial turf—which contributed to numerous injuries—but for a pervasive smell that hinted at urine and spoiled meat. City officials told fans to stay home when it was imploded in 2004 but many showed up anyway, cheering when the blasting began. Well, that’s one way to eliminate a bad smell. For my part, I don’t recall the Vet as smelling particularly bad—perhaps because in graduate school we bought the cheapest seats high in the upper deck. We’d sit among a collection of old-timers and oddballs, guys with transistor radios and little old ladies who kept score sheets. True connaisseurs. Smelly or not, the Vet resembled an enormous toilet bowl. It was a barren and unfriendly place, especially when the Mets were in town and fist-fights would break out in the late innings, with beer cups flying and bodies tumbling down rows of seats. There was a post-doc from Texas in the Penn psych department named Dave, who was a bit of a bipolar case. At the beginning of his periodic upswings he was fantastic company, Mr. Sociable. You could walk into any bar or party with him and pretty soon everybody was your best buddy. Weeks later, at higher altitude, he’d start agitating for adventure. You’d be studying for an exam and a few minutes before the first pitch there would be Dave at the door: “C’mon, let’s go see the ball game. C’mon.” He’d snort a few lines, fire up the Camaro convertible, and off we’d go to the Vet with Dave holding a can of beer and doing 85 on the Schuylkill Expressway. My smell memories of Philly fester to this day. The streets between my apartment and the psych lab were lined with gingko trees and their ripe fruit would fall on the sidewalk and rot, giving off the stench of butyric acid (think stinky feet to the fifth power). Then there was the smell that hung over the Tinicum marshes where the Schuylkill joins the Delaware River. It was the stagnant, retch-inducing stink of an outhouse. Embarrassed taxi drivers, on the way to or from the nearby airport, always made to sure to draw attention to the marshlands, lest their fares get the wrong idea about the source of the odor. This being Philly, the swamp smell was often mixed with something a little more sinister. Early one morning an ecology grad student in the bio department was knee deep in the Tinicum marsh recording bird vocalizations when he came across a decomposing corpse, evidently a casualty of the ongoing mob wars. Dave used to wear a lot of cologne. Like the Vet, he eventually imploded. He hung himself from the staircase railings at a friend’s house. I think about him every once in a long while and I miss him. But I don’t miss Philly.